This is part I of a multipart series, you will be able to navigate by clicking on the pictures in the box below. While it appears to be obvious that eating a low-to-no-carbohydrate diet would be the easiest way to manage your blood glucose levels, carbs are by far not the only nutrient that will have an effect on your blood glucose levels. In a recent overview article, Martina Heer and Sarah Egert from the Department of Nutrition and Food Science at the University of Bonn provide a decent overview of the multiple ways by which "other nutrients, such as dietary protein and amino acids, the supply of fat, vitamin D, and vitamin K, and sodium intake seem to affect glucose homeostasis." (Heer. 2014). In the coming weeks I will use their review as a starting point for my own overview of the effects of non-carbohydrate and "almost cabohydrate" nutrients on glucose metabolism. 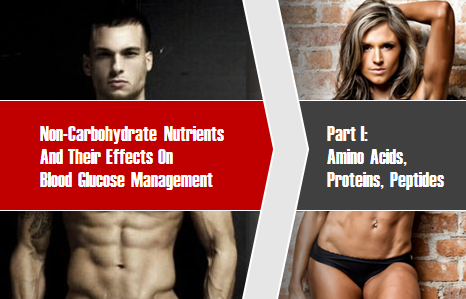 And for today, I decided, to conclude this week that was full of exciting protein news on Monday ("Protein Power" | read more) and Saturday ("Dieting, High Protein, Testosterone & IGF-1" | read more) with - what else could it be - a summary of a the anti-diabetic effects of peptides, proteins and amino acids. Protein, the glucose repartitioner?! Due to its insulinogenic effects protein increases the non-oxidative glucose disposal. In contrast to whey proteins, turkey, beef, eggs and co., i.e. "slow digesting proteins", will induce a significantly reduced insulin surge and have a correspondingly less pronounced effect on blood glucose. Insulin is yet probably not the major, or primary agent behind these effects. More recent studies appear to suggest that the mechanism of the blood glucose lowering-effect of whey protein seems to be mediated primarily via increases in glucagon-like peptide 1 (GLP-1). This "satiety hormone" will then, in turn, lead to increased insulin secretion (Lan-Pidhainy. 2010; Maier. 2012). Combined with its ability to decrease gastric emptying and the correspondingly reduced influx of glucose through / from the portal vein (Maier. 2012; Bendtsen. 2013), GLP-1 makes the perfect anti-diabetes "drug" - no wonder that Ligratude, a synthetic analogue is already used very successfully in diabetes and obesity treatment (Astrup. 2012). In its effects on GLP-1 whey is pretty unique. Even similarly fast absorbing protein sources, such as soy, or other dairy proteins such as casein, do not cause such a pronounced effect on GLP-1 and insulin secretion. 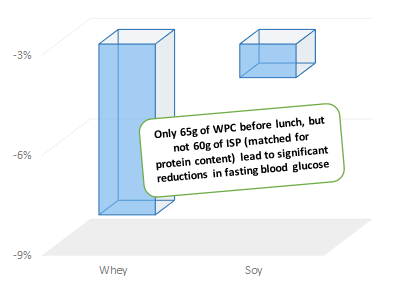 A recent study from the Iran University of Medical Sciences and Health Services, for example, compared the effects of the pre-ingestion of additional 65/60g of whey protein concentrate (WPC) and soy protein isolate (ISP) before a meal on a hole host of metabolic markers in 45 healthy overweight and obese men. Hypoglycemia warning: If experience fatigue, agitation, sweating, shivering, feeling cold, a having really bad temper and/or other symptoms of low blood sugar, after having a bolus of whey protein, it may be a good idea to (a) check your blood glucose levels and (b) consume your whey with a source of readily available carbohydrates in the future. What the scientists did not observe, though, was an improvement in fasting blood glucose levels in the subjects in the soy protein group. The latter was - and that's in line with what we've said before about the effects of different protein sources on GLP-1 - "whey exclusive". Similar beneficial effects have been observed, among others, by Lan-Pidhainy, whose study was the first to prove that the insulinotropic effects of whey protein are not attenuated by insulin resistance (Lan-Pidhainy. 2010). In contrast to Tahavorgar et al., the researchers from the University of Toronto measured the acute effects on co-ingesting 30g of whey protein with a standardized 50g glucose load - a study that's obviously of lower real-world significance than the chronic administration scheme in the more recent study by Tahavorgar et al. (2014) or the 60-day bedrest study Martin Heer et al. conducted for the NASA. In this tightly controlled study, the provision of a high protein diet (1.45g/kg body mass/d dietary protein plus 7.2g branched chain amino acids per day) with an "animal:vegetable protein ratio" of 60:40, almost fully compensated for the bed rest-induced 35% reduction in insulin sensitivity during 60-day bed rest. The ameliorative, yet not significant effect of soy protein isolate on the blood sugar levels of the subjects in Tahavorgar study, as well as the observations the researchers from University of Bonn made when they studied the effect of bed-rest, confirm that it does not always have to be whey protein to benefit from the anti-diabetic effects of the chains of amino acid residues we know as "proteins". Ok, the GLP-1 inducing effects of whey protein appears to be particularly pronounced, and partly related to the presence of certain functional dairy peptides, which may, as the data from a 2009 study by Chen et al. suggests, be even more pronounced for casein than whey (see Figure 3). the plasma membrane in the pancreas and finally to an exocytosis (=pumping process) of insulin. While 200mcg of chromium are essential, consuming way more can have pro-diabetic effects | learn more. You can learn more about the other nutrients in the next installment(s): I know that this is not exactly fair, but let's be honest - Aren't there better ways to spend a Sunday afternoon than writing SuppVersity articles? I personally feel the answer is "YES!" The discussion of the effects of dietary fat, in general, (one of the things that's going to be mentioned may already be inferred from Figure 2) and individual fatty acids in particular, as well as the influence of vitamin D, vitamin K, calcium, magnesium, chromium, zinc, sodium, and a couple of other nutrients will thus have to wait until next week (some even longer ;-). Astrup, Arne, et al. "Safety, tolerability and sustained weight loss over 2 years with the once-daily human GLP-1 analog, liraglutide." International journal of obesity 36.6 (2012): 843-854. Bendtsen, Line Q., et al. 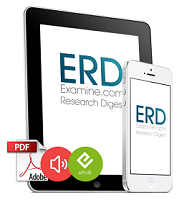 "Effect of dairy proteins on appetite, energy expenditure, body weight, and composition: A review of the evidence from controlled clinical trials." Advances in Nutrition: An International Review Journal 4.4 (2013): 418-438. Brennan, Lorraine, et al. "A nuclear magnetic resonance-based demonstration of substantial oxidative L-alanine metabolism and L-alanine-enhanced glucose metabolism in a clonal pancreatic β-cell line metabolism of L-alanine is important to the regulation of insulin secretion." Diabetes 51.6 (2002): 1714-1721. Chen, Qixuan, and Raylene A. Reimer. "Dairy protein and leucine alter GLP-1 release and mRNA of genes involved in intestinal lipid metabolism in vitro." Nutrition 25.3 (2009): 340-349. Cunningham, GA, et al. "L-Alanine induces changes in metabolic and signal transduction gene expression in a clonal rat pancreatic β-cell line and protects from pro-inflammatory cytokine-induced apoptosis." Clinical science 109 (2005): 447-455. Dunne, M. J., et al. "Effects of alanine on insulin-secreting cells: Patch-clamp and single cell intracellular Ca 2+ measurements." Biochimica et Biophysica Acta (BBA)-Molecular Cell Research 1055.2 (1990): 157-164. Heer, Martina, et al. "High Protein Intake Improves Insulin Sensitivity but Exacerbates Bone Resorption in Immobility (WISE Study)." (2012). Lan-Pidhainy, Xiaomiao, and Thomas MS Wolever. "The hypoglycemic effect of fat and protein is not attenuated by insulin resistance." The American journal of clinical nutrition 91.1 (2010): 98-105. Meier, Juris J. "GLP-1 receptor agonists for individualized treatment of type 2 diabetes mellitus." Nature Reviews Endocrinology 8.12 (2012): 728-742. Tahavorgar, Atefeh, et al. "Effects of whey protein concentrate consumption compared with isolated soy protein on metabolic indices, inflammatory and oxidative stress factors in healthy overweight and obese men." Razi Journal of Medical Sciences 20.115 (2014): 17-30.